Come join the team that supports learning for all, whatever it takes! The job fair will be held at Lakewood Middle School, 1135 Lakewood Circle, 9:00 a.m. – 4:00 p.m. on Saturday, June 30. Many employment opportunities such as food service, maintenance and operations, instructional assistants, para educators, substitute teachers, and more. Flexible schedules with full and part-time positions available. 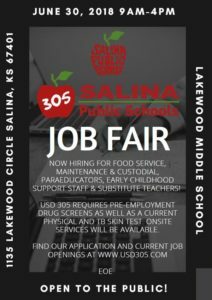 Salina USD 305 offers a comprehensive benefits package including medical, dental, life insurance and disability as well as generous paid leave plans. Excited to know more? Join us June 30 to learn about becoming a member of the USD 305 team! Salina USD 305 is an equal opportunity employer. For more information about the Job Fair or currently open positions visit www.usd305.com. Local Contact: Eryn Wright, Executive Director of Human Relations, phone 785.309.4700.